The Self-Defending Bomber Concept--Could It Have Worked? 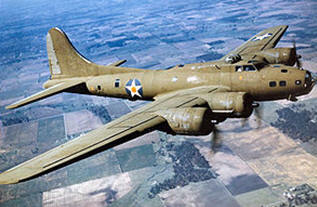 All during World War Two, American bombers used as standard defensive armament Browning .50 machine guns...and nothing else. As a result, unescorted bomber crews became relatively easy "pickings" by German fighters, which possessed much more powerful, long-range weaponry...meaning the Germans could stay out of range of American firepower with the .5's...and fire cannon at will, bringing down many American bombers and their crews to their deaths. So the question: would it have been possible for the self-defending bomber concept to have worked in the War if the B-17's and B-24's over Germany had been armed with heavier defensive weapons? What follows is a story very few people have explored but which needs at long last to be explored. To set the stage, and get the broad picture, we have to go back in time to the latter part of World War I, when a multitude of nations were working to perfect heavy guns. In "Rapid Fire" by Anthony G. Williams, this statement is made on page 86: "A line of development came from the need to produce a hard-hitting but still compact and lightweight weapons for aircraft. Already it was clear that even early military aviation pioneers realized that defending an aircraft would take something bigger than a regular machine gun. Strangely enough--and yet at the same time quite logically--the need for big guns aboard aircraft was "learned" from anti-aircraft weapons. From "Olive-drab.com" comes this comment from an article about the .50 machine gun. "Experience in France in 1917 showed the need for a heavy machine gun that could act against aircraft (fixed wing and balloons) tanks and other armored vehicles that were then first appearing on the battlefield." The evolution of machine guns seems to have had a tortured history. Page 98 of "Rapid Fire" says this: "The evaluation of heavy machine guns was rather confused. They had proved largely ineffective in the AA (antiaircraft) role. An American analysis based on the last year of the war (WW II) showed that over 50,000 .50 rounds were fired for every aircraft brought down, compared with 500 (40 mm) Bofors rounds--that is, almost two hours of continuous firing per gun, compared with four minutes." All well and good for end-of-war studies, but didn't the Allies know all this much earlier? This time, the lesson comes from naval guns used during WW II. "War experience soon justified the concerns of both the British and the Americans about the .5" machine gun's lack of range and hitting power. Their high rate of fire means that they had some effect against strafing aircraft which came too close, but they were of little use against torpedo and dive bombers. "The smallest calibre to prove its worth was the 20 mm. In Allied navies, this calibre became virtually synonymous with the Oerlikon S, the most powerful of a family of API blowback 20 mm weapons developed by the Swiss firm between the wars. It was introduced by the RN (Royal Navy) in 1939 and by the USN (US Navy) in 1941. OK--so the armed services realized the value of big guns in anti-aircraft guns starting back in WW I, but now where do the air corps come in? "By far the most significant of the wartime automatic guns was the first 20 mm automatic cannon in the modern sequences of development, the German Becker. Development started even before the war but significant use was not made until 1917, when it was first primarily used for the defence of heavy bombers and airships." A pivotal point is now within reach here, as we show that cannon for bombers was viewed as viable well before WW II. And speaking of studies, get this! To this very day, one of the closest-held secrets of the U.S. Army Air Forces of WW II is that of the death rate of the bomber crews during combat. Despite horrible mounting losses throughout the war, which totalled 88,000 airmen dead by V-E day, AAF top command refused to arm the B-17s and B-24's operating over Europe with any defensive armament more powerful and with longer range than the Browning .50 caliber machine guns. This enabled German fighters and bombers to simply cruise alongside the bomber formations outside .50 caliber range and fire their longer-range and much harder hitting 20 mm (.79 caliber) automatic cannon and fire rockets into our bombers with, of course, deadly results. From "Clash of Wings" by Walter J. Boyne, Page 314-315, comes this reality check: "So equipped, they (the Germans) would linger outside the range of the American bombers's guns and lob rockets into the formation. It was a terrifying sight, for the USAAF crews could watch the smoke trail from the launch of the big 250 lb. mortar shells from invulnerable aircraft sitting out of range. A hit from the 21 lb. warhead was fatal and usually broke up the tight formation, allowing single-engine fighters (carrying 20 mm cannons) to close with the survivors. "The few planes with the 20 mm guns flew the tail-end Charlie positions in their formations because the planes in this position were often attacked by fighters with guns of greater range than the 50's normally installed in the tail position. The fighters could lag behind the bombers and shoot on them, but the bombers lacked guns of effective range to shoot back." So...this was the situation, despite the fact that "US bomber aircraft....proved modern, up to date load carriers, with surplus power that allowed them to run full auxiliary equipment needed to carry and maintain heavy armament (Joe Mizroke, "Wings, Sky Guns" emphasis ours), and the fact that at the same time, in German fighters..."truly enormous killing power was carried aloft in the force of multi-20 mm and 30 mm cannon installations, some aircraft, particularly night fighters, being equipped with 37 mm and monster 50 mm weapons! (Ibid) In 1941, typical armament wielded by Focke-Wulf 190A-2 fighters was already four 20 mm cannon and two 7.9 mm machine guns! So here is the situation: automatic 20 mm air-to-air defensive cannon firing high-explosive shells had been developed 25 years earlier by the warring nations during WW I, and were perfected and were available to the U.S. military between the World Wars and throughout World War II. The 20 mm HS 404 was standardised by the USA in 1940 and manufactured by Bendix and other companies...but saw no operational use in US bombers over Europe throughout World War II, and saw relatively little use even in US fighters throughout the war! The U.S. 8th Air Force alone flew a total of 10,754 bombing missions over Europe in WW II, consisting of 298,297 total sorties. It is, we believe, a practical certainty, that an average of at least one destroyed US bomber per mission could have been saved along with her crew if US bombers had been adequately defensively armed. Probably about 30,000 of our bomber crew airmen could have been saved rather than sent to the slaughter as so much cannon fodder. Critics say that Monday-morning quarterbacking is easy---that it's easy to sit and criticize. Sometimes that's a fair statement----but what do you say when the "quarterbacks" of the military knew what the most effective plays would be many years before WW II? The "plays" that would have saved many thousands of American boys? How can you explain this to the parents or wives of men who never returned?